Click the Manage link in your network’s navigation. Select the Members option below Your Members. The Manage Members page opens. Find the member you want to promote. Search for him or her by using the Search box next to the Search button or clicking successive pages at the bottom of the Members section until you find the member you want to promote. Select the check box next to the member’s name, click Actions, and select the Set Role: Administrator option from the drop-down list that appears. This drop-down list also includes the option to ban a member. Your group member has just been promoted. 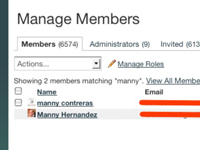 If you need to demote an Administrator to member level, follow the same steps, but select the Set Role: Member option from the Actions drop-down list.